Mount Baker’s classic North Ridge represents the next challenge for those interested in honing their alpine skills on more advanced glaciated terrain. This alpine route is truly one of the best moderate “big mountain” alpine snow and ice climbs in the Lower 48 states. Previous climbing experience and advanced alpine climbing skills are required for this climb. We approach the North Side of Mount Baker, the North Cascade’s highest volcano, via the Heliotrope Ridge trail, the same trail which takes us to the Coleman Deming ascent. After traversing the Coleman Glacier to the North Ridge, we climb several pitches of 60 to 70 degree alpine ice up the large exposed ice cliff before reaching the upper mountain. This spectacular climb offers dramatic views down to the Roosevelt and Coleman glaciers, followed by a final push up steep snow slopes to Mount Baker’s massive summit, providing climbers a rewarding alpine experience. We descend via the Coleman Deming route which takes us down the Roman Wall to the west and to the saddle between the Black Buttes and Baker’s summit. A descending traverse of the Coleman Glacier quickly takes us back to the lower mountain and on to base camp where we can relax and enjoy the evening alpenglow. Trail synopsis: From the parking area, the well-maintained trail gains elevation quickly, which makes this approach a bit shorter than the southside. After crossing Kulshan Creek at 2 miles (4500 ft.), we break through the trees, crossing another stream at 5400 feet, we climb the steep moraine we and arrive at the Hogsback Camp between 6000 ft. and 6200 feet. Our route then traverses the Coleman Glacier to a bivy site at 6,800 feet. Enjoy a Northwest Alpine Guides adventure on glaciers and summit a classic Pacific Northwest volcano. 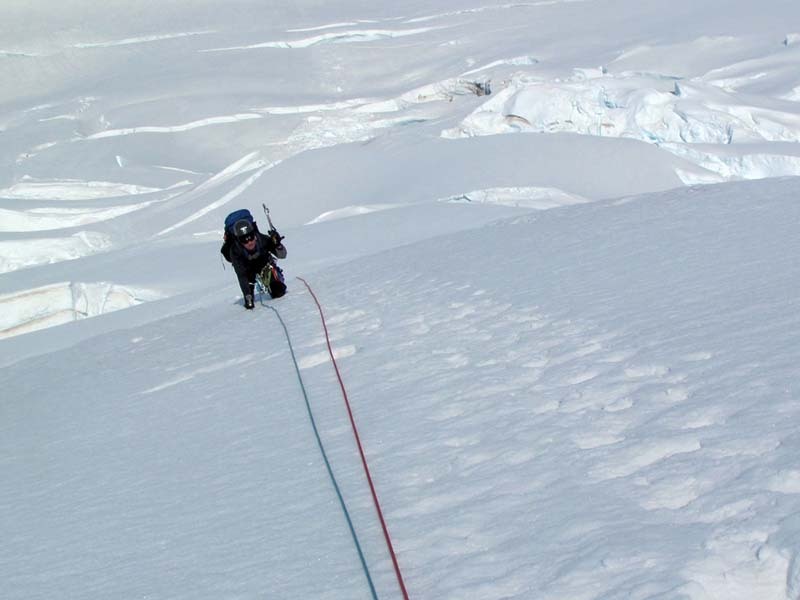 Ascend Mount Baker’s North Ridge route and climb steep alpine snow and ice to the mountains spectacular summit. We lead the Mount Baker North Ridge at a 2 to 1 climber to guide ratio ensuring that you receive personal attention and hands-on instruction throughout the climb. The hike to high camp takes 4 to 5 hours. After ascending to Hogsback camp at 6000 feet, our route traverses the Coleman Glacier to a bivy site at 6,800 feet. We gain 3300 feet from the trailhead to high camp. The day begins with an alpine start. Our route travels up the right-center of the Coleman Glacier, weaving around large crevasses to the toe of the North Ridge. The standard start crosses a double bergshrund and then goes up a broad gulley feature of 40 degree snow. Straightforward glacier travel on the central ridge section steepens into ice slopes that lead up to the base of the prominent ice cliff spanning the bulk of the north face. As the angles steepen we’ll start belaying and then climb, in a classic and exposed position, directly up the ice cliff in a few short pitches (60-70 degrees). Beyond this it’s more glacier travel, some short and steep traverses, and the final summit plateau. Depending on conditions and the pace of the group, it takes from 9 to 12 hours to reach the top. Gorgeous views of the Cascades reward you as you stand on the summit of the North Cascade’s highest volcano. We gain 4000 feet from high camp to the summit. After enjoying summit views from Mount Baker’s highest point and celebrating our success we descend the Coleman Deming route to Hogsback camp near the toe of the Coleman Glacier. After breakfast, we break camp, pack our gear and retrace our hike back to the trailhead. We generally arrive back to the trailhead by early-afternoon and conclude our adventure in Sedro Woolley.